The following article is based on my own interpretation of the said events and/ or publicly available information. Any material borrowed from published and unpublished sources has been appropriately referenced. I will bear the sole responsibility for anything that is found to have been copied or misappropriated or misrepresented in the following post. It looked amazing…just as if God had decided to bake a marble cake! And this is my reaction just by seeing the photos available on the internet (one of which you can see below). The sight was of a supreme beauty, one that only nature could create! It definitely looked picturesque…the snow settled on the sand as the largest dry desert of our planet experienced a heavy snowfall. 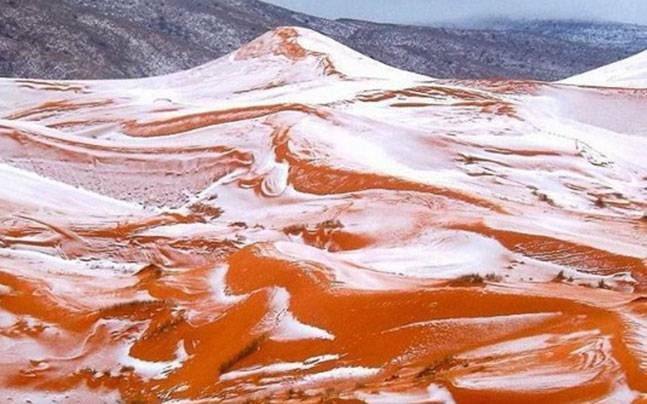 As beautiful as it may look, snow falling on the sand dunes of Sahara is something very rare. It has happened just once before, thirty seven years ago in a much lesser intensity and the underlying reason to it is not so beautiful…rather it’s ugly! Well, to be scientific, an extremely low pressure area was passing over North Africa which on hitting the landmass caused the air to cool suddenly and condense, thus the snowfall. But going beyond the theoretical explanation, this is a living proof of the damage we’ve done to our planet. Global Warming, later rechristened as ‘Global Climate Change’ has been nibbling at our healthy existence slowly but steadily and the issue has clearly not been given the attention it deserves. Its only now, when few of the biggest cities in the world have become literally uninhabitable have we “somewhat” realised the gravity of the situation. Since last few years, many parts of earth are witnessing unusual phenomenon like early melting of glaciers, heat waves in winters, undue monsoons etc. Nature has always given us subtle hints regarding the continuous damage we’ve been inflicting on it and we as the civilization have been vehemently ignoring them. But as of late, the hints have started becoming bolder like the incident stated above. Nevertheless, it was a treat for the eyes to see white snow mixed with red sand, however we must strengthen our efforts towards green initiatives. The government of Kiribati, a pacific island nation with unparalleled beauty is buying land in Fiji for relocation of its citizens since the sea level has been constantly rising and the coral island nation may cease to exist few years down the line! Are we serious! Has it really come to this? Well, in that case it won’t be far when we would be searching for a new planet to relocate! At the international level the environment protection must not be limited to signing of treaties somewhere in the Alps, but formulating measures to implement them. At the individual level too, there’s a lot we can and must do. For starters, let’s pay attention if we switch off the A/C next time we leave the room! India on 22nd April signed the historic Paris climate agreement along with more than 170 nations, marking a significant step that has brought together developing and developed nations for beginning work on cutting down greenhouse gas emissions to combat global warming. Environment minister Prakash Javadekar signed the agreement in the United Nations (UN) General Assembly hall at a high-level ceremony hosted by UN secretary-general Ban Ki-moon. The ceremony was attended by heads of government, ministers, corporate leaders and artists. “This is a moment in history. Today you are signing a new covenant with the future,” Ban said. “We are in a race against time.” The opening ceremony included music from students of New York’s Julliard School and a short video bringing the “gavel moment” from Paris to the signature ceremony. With 171 nations, the signing ceremony for the climate agreement set the record for the most countries to sign an international agreement in one day, previously set in 1982 when 119 countries signed the Law of the Sea Convention. The signing is the first step towards ensuring that the agreement comes into force as soon as possible. After the signing, countries must take the further national (or domestic) step of accepting or ratifying the agreement. The agreement can enter into force 30 days after at least 55 parties to the UN Framework Convention on Climate Change, accounting for at least 55% of global emissions, ratify the agreement. India has maintained that the burden of fighting climate change cannot be put on the shoulders of the poor after decades of industrial development by the rich nations. It has announced plans to quadruple its renewable power capacity to 175 gigawatt (GW) by 2022 as part of the government’s plan to supply electricity to every household. India seeks to add 100GW of photovoltaic capacity, 60GW of wind power, 10GW of biomass and five gigawatts of hydro projects. Earth Day is an annual event, celebrated on April 22, in which events worldwide are held to demonstrate support for environmental protection. It was first celebrated in 1970, and is now coordinated globally by the Earth Day Network and celebrated in more than 193 countries each year. In 1969 at a UNESCO Conference in San Francisco, peace activist John McConnell proposed a day to honour the Earth and the concept of peace, to first be celebrated on March 21, 1970, the first day of spring in the northern hemisphere. This day of nature’s equipoise was later sanctioned in a proclamation written by McConnell and signed by the then Secretary General U Thant at the United Nations. Earth day this year is especially significant, as the landmark Paris agreement will be signed by 122 countries of the world. The world has pledged to limit temperature rise from global warming to 2 degrees Centigrade, and attempt to become carbon neutral by 2050. This agreement, if abided by honestly, shall bring down world pollution levels and bring global warming under control. Not only this, the regular earth day practices followed around the world, such as composting, carpooling, carbon footprint reduction and recycling drives, ensure that this day turns out to be a happy one for mother earth. A question arises: Does this day really make a difference? The answer is unambiguously, yes, it does! However, what do all of us do on the remaining 364 days of the year? The answer is: Mostly doing more harm than good. The earth day spirit is all about thinking for the greater good. One must introspect, rise above one’s ego, and resolve to do his/her bit to save mother earth. Every drop of water preserved and every watt of electricity saved makes a huge difference. The time is ripe to stop being cynical, pull up our socks, and save the planet. Amidst hope and hype, the landmark climate change accord that came out of negotiations at the COP21 climate summit last December was signed in Paris. 171 nations inked the deal on 23rd April, a record number for a new international treaty. The Paris Agreement is perhaps the world’s biggest leap forward in climate change policy in history. It sets the ambitious goal of limiting warming to “well below” 2 degrees Celsius above pre-industrial levels. That more or less requires the entire world to get off fossil fuels this century. A few years ago the very idea of a global treaty to limit climate change seemed almost impossible as the ghosts of the failed Copenhagen summit in 2010 haunted them. It had to be signed and ratified by at least 55 countries representing at least 55% of global greenhouse gas emissions. When countries sign the agreement on Friday, they are signaling their intent to ratify the document as soon as possible. Why is the Paris Agreement such a big deal? Humans are causing global warming primarily by burning fossil fuels like coal, gas and oil, and by deforestation. If we don’t stop doing that stuff we’re going to ruin the future. We risk making the planet uninhabitable for future generations and hence defeating the very concept of sustainable development. Warming threatens to drown coastal cities, push animals to extinction, decrease crop yields in certain regions and encourage the spread of disease. The United Nations had been trying for decades to get countries to agree on a framework for fighting climate change, which is a unique problem in that it requires the cooperation of polluters around the world. USA and China, who account for 36% of the total greenhouse emissions and have stood in the way of such treaties, were key proponents of the Paris deal which is a cause for hope. Symbolically this treaty was signed on the 46th EARTH DAY. The show must go on. This popular phrase is used in show business to convey that come rain or shine a planned show has to be staged for patrons. The overlords of cricket, in this case the Indian Premier League (IPL) seem to have taken this phrase to heart. Much to the astonishment and shock of many, including cricket lovers, the BCCI planned twenty T20 matches in water-starved Maharashtra. With politicians looking the other way, it finally fell on the Maharashtra High Court to do the needful. On Wednesday, while hearing a PIL against the hosting of IPL matches by the state filed by Loksatta Movement, an NGO, the court came down heavily on the cricket board. Terming the use of water to maintain cricket pitches as “criminal wastage, the HC said that the state is facing a drought-like situation and that the matches should be shifted out of the state. “People are more important or your IPL matches? How can you be so careless?” a division bench headed by Justices VM Kanade and MS Karnik asked the BCCI. For those who are still unconvinced about the hullaballoo, here is what the Mumbai Cricket Association will use for its seven IPL matches at the Wankhede stadium: 40 lakh litres. India is facing a severe water crisis and Maharashtra along with Bundelkhand, which straddles Madhya Pradesh and Uttar Pradesh, are the two major crisis points. In Maharashtra’s worst-hit region, Marathwada, dams and reservoirs are running dry and tankers are doing booming business. In Latur, one of the three badly-hit districts in Marathwada, the authorities imposed prohibitory measures to prevent clashes at one of the filling stations on the outskirts of the city after residents, fearful of the future, opposed sharing reservoir water. Following crop failure, grain procurement is down to Rs 5 crore as opposed to an average of over Rs 25 crore every day. Industries, especially the agro-processing and manufacturing units, have shut down indefinitely, says a report in Quartz. The situation is not going to improve anytime soon. According to media reports, summer of 2016 will see above normal temperature. The aftermath of this unbearable weather: reduction in reservoir levels, severe heat, depleting ground water and unavailability of drinking water. In such a scenario, the court is correct to raise the moral question: Is it right to go ahead with cricket matches when we really have a water crisis of huge proportions on hand? Many would argue that life will not stop for the crisis and that the water saved will not make any difference. Probably not, but then the principle of moral imperative cannot, rather must not, be overlooked here. It is a pity that the court had to step in on an issue which should have been acted upon naturally to anyone conversant with the dire water situation in the state. Cricket is a game loved by the many Indians, but it exists in socio-economic milieu from which it cannot be divorced. The water levels in Mysuru have been at a significantly low level over a considerable period of time. The administration has the option to subsidize water and provide it as ration in view of the depleting water resources. However, the administration doesn’t plan on doing so. The administartion was of the view that the much-talked-about scarcity and depletion were just superficial claims. After properly analysing the major reservoirs – Krishnaraja Sagar and Kabini reservoir, suffcient amount of water was available to satisfy the population’s needs. The available water could meet the demand for potable water. However, the supply for irrigation canals was suspended. The decision to stop water supply for irrigation was taken after a team comprising of the Regional commisioner and Deputy commissioner of Mysuru and Mandya had properly accessed the water availability there. Officials from the Irrigation Deptartment pointed out that there won’t be any threat to drinking water availability as there was ample water available in the dam to take care of the potable water needs till June-July. However, the need of the hour is to use water judiciously and sparingly and prevent any execessive wastage. Mysuru’s major drinking water supply comes from the Cauvery via KRS. The river is still the primary source of water for nearly 50 per cent of the city, but a couple of years ago, parts of the city started receiving water from the Kabini dam. Mysuru had faced a severe water crisis in the summer of 2013, as the KRS water level dropped to almost nill. Even places such as Bengaluru, Mandya and Ramanagaram faced a water crisis. When the water level dropped to such a huge extent, water was pumped from the riverbed using four heavy-duty emergency pumps to ensure supply. The problem of water availability is not limited to Mysuru. Karnataka, Mumbai, Delhi and other highly populated states of India have begun to face similar problems. Water is a scarce resource and it should be carefully utilized. Due to dense habitation of these states, the scarcity has amplified. The sources of water and the availability of usable water cannot exceed a certain level. The authorities need to be proactive in spreading awareness and ensuring proper usage of the resource. This is just the beginning of a catastrophe that can occour if things are not taken under control soon enough. Stung by the February 2016 judgement of the World Trade Organization (WTO) that India’s rules over use of domestically manufactured solar power equipment violate international trade rules, the government of India is planning to file counter cases against the US. India’s Minister for New and Renewable Energy has announced intent to file as many as 16 cases against the US for mandating project developers to use domestically manufactured solar power equipment. The Indian government will reportedly be targeting policies followed by some US states. India’s intention to promote Indian manufacturing of solar power equipment hit a roadblock after the WTO ruled, for a second time, in February against the government’s policy to mandate the use of India-made solar power equipment for a set amount of capacity offered in the auctions. While the Indian government significantly reduced the share of capacity that would use Indian modules, the US seems unsatisfied. During the first Domestic Content Requirement (DCR) auction under the National Solar Mission, as much as 50% of the offered capacity was reserved under said provisions. That percentage has dropped considerably in subsequent auctions. When the current government took office it refused to levy anti-dumping duties on imported modules despite repeated pleas from the domestic manufacturers. The Indian government reportedly also offered a compromise ahead of the February judgement. According to media reports, the government stated that that DCR projects shall be restricted to only government-owned companies and entities, like NTPC Limited, Coal India Limited, Indian Railways, and the Indian Defence Forces. With no compromise achieved, the Indian government is now looking to up the ante with counter complaints at the WTO. Over the last two years, the rains have been below average. This is thought to be largely due to El Nino. El Nino is the slight warming of the surface waters of the Pacific Ocean, and is known to subdue the rains across India. The current El Nino conditions peaked in January, and are now fading. It is predicted that La Nina will emerge by the end of the year. La Nina is the opposite of El Nino – the cooling of the surface of the Pacific, and often enhances the rains over India. Monsoon forecasts by the Indian Meteorological Department have been wrong in the past. In 2009, the monsoon was predicted to bring average amounts of rain, but the monsoon was actually the worst in nearly four decades, with a deficiency of more than 20 percent. The monsoon rains are expected to start to start in June, and the country’s 263 million farmers will be closely watching the skies. Global warming, as an issue has been discussed in so much detail that its mere mention may question the point of doing so. Whole world seems so much consumed by the idea of global warming that every act that we do, everything that we consume and every item that we produce seems to decide whether the catastrophic culmination of weather failure will happen in near future or not. But this is surely not illogical. Mankind has learnt from its mistakes. Several times in world history, we have celebrated beginning of a new change and, have repented the change as speedily the very next day. Now we are careful and farsighted. We study future scenarios, speedily merge our new capabilities to leverage gains as soon as possible. The society is a fast learner now and we adopt new developments more readily than how we did few decades ago. So, you shouldn’t complain if I express my disappointment over primitive reactions of a few people towards onset of electric cars. Electric cars as the name suggests, run on electricity and not on the non-renewable fuels like petrol and diesel. So, they are expected to leave no carbon footprint unlike their older counterparts. The critics then started speaking about the problems in cost, range and charging speed. Because of their less demand now, electric cars are costly to make and purchase, the persistent worry of having the car discharged midway every 50-100 miles and the shortage of charging centers and the less charging speed (around 4 to 6 hours). Apart from these, the cars are mostly two seaters and their batteries have to be changed every 3-10 years. Big companies, who have been technical leaders in futuristic approach like Tesla, Nissan are spending heavily on research and development in electric car projects. Now a new shortcoming in electric cars have seemed to surface. Critics say that the manufacturing of the common lithium-ion electric car battery and their final disposal entails release of harmful pollutants. Also, electricity that feeds this novel conception itself comes from processes that run on non-renewable resources, chiefly coal. And this is not a minor conjecture. Surveys have been carried out to make the comparison. One of the findings is that the energy intensive manufacturing of EVs mean that some cars make almost double the impact on global warming as conventional cars. If the energy is coming from coal, the electric cars produce 3.6 times more soot and smog deaths than gas driven automobiles. Also the greenhouse effect of soot is even more than carbon di oxide itself. While we went on reprimanding electrical vehicles for being disruptive, we neglected some essential facts. First of all, not all energy is coal powered. According to a 2012 study only 40% of total energy is coming from coal and according to Department of Energy and Climate Change, by 2020, this will reduce to around 10%. In fact, there are countries like Norway that almost completely run on renewable energy like hydroelectricity. Even if we choose to expunge these facts, we have to face a simple reality. Developing nations like India and China are going to pour a large amount of greenhouse gas in the coming future mainly because their energy will come from coal. And developed countries are doubting electric vehicles because coal will cause global warming. Connect the two and you will notice that our opposition to green vehicles simply means delaying the inevitable and more we delay it, more are we aggravating the greenhouse problem. Instead of quarantining green vehicles, we need to strike at the source. An innovation like electric vehicle is just in its budding stage and needs extensive research and trials for betterment. Nipping this now will mean stopping the progress of something that could have been timed with proper onset of renewable energy resources to solve the greenhouse problem of Earth. Let’s not be the ones only sting problems, but the ones who are actually solving them. Conferences of Parties held their annual meeting in Paris, France in Dec’15 to come to an agreement on combating the climate change. The conference attended by 196 members is able to reach an agreeable text now known as “Paris Agreement”. Paris agreement will come into effect latest by April’16 once all the legal procedures are taken care. As per the text, target is to limit the temperature increase by 2˚C as compared to pre-industrialization levels and net zero GHGs emission by the 2nd half of the 21st Century. To achieve these targets, each nation will add new legislatures or modify the old ones to comply with the conditions. There is a provision of 5 year review mechanism to monitor the progress and set future targets. A large portion of success will depend on developing nations such as China and India. They are growing and consuming resources with rapid pace. These are the most populous countries in the world. So, as the living standard in these countries rise, the GHGs emission will rise with the same degree and will cause an even greater imbalance in environment. That’s why it is very important to provide cheap clean technology to developing countries so that they can transit easily between to clean energy. Till now, there is one more conceptual difference between the developed nation’s and developing nation’s argument. Developed nations argue that the emission should be evaluated on overall country basis; on the other side developing nations argue emission should be evaluated on per capita basis. In this regards, Paris agreement goes with the developed nations but assign provisions for technology transfer so that developing countries can reduce their emissions. Agreement also argues for the need to incentivize the green methods and promote innovation so that new clean technologies can come up. Organizations should be encouraged to invest in the green technology research and apply the known technologies. Initially some businesses need to be given some tax incentives to venture into this and then it will become a cycle. We need to reduce our dependence on fossil fuel as employ new clean fuels which are less toxic. If we were able to comply with the agreement then we can left an climate where our next generations can go outside and do things, otherwise Humans will have no one else to blame other than themselves.